Good afternoon, folks. Rain and gusty winds are rolling across the state today, but the main focus of the forecast continues to be on the severe weather threat late Monday and early Tuesday. This is a potent storm system that is likely to cause issues across much of Kentucky. Winds may reach 40mph at times this afternoon and evening. Their adjustments across Kentucky are way too slow and too far south. 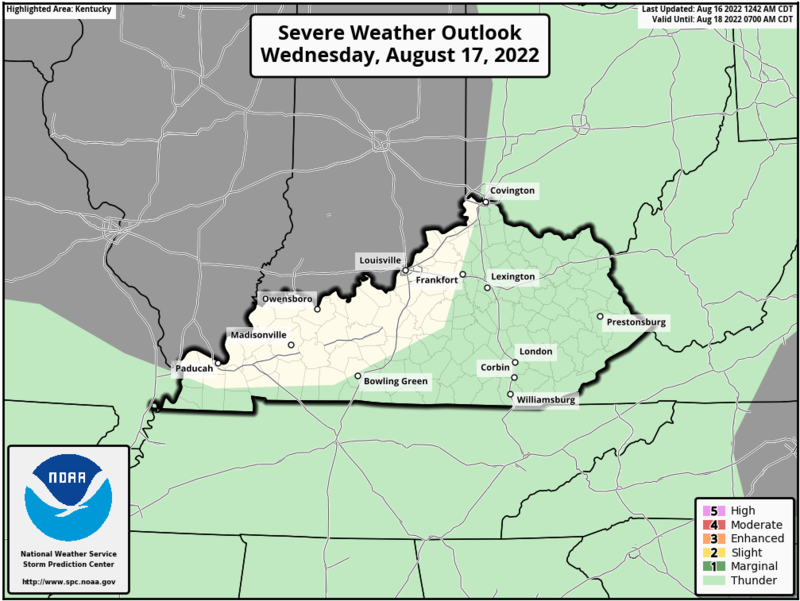 I expect the main severe threat to ramp up across central Kentucky Monday night. Watch for this area to get upgraded to a moderate risk. Damaging winds, large hail and a few tornadoes are all possible across the state. The wind damage threat is very high, with power outages a good possibility. This may very well cause issues for a few polling places early Election Day. 2″-3″ of rain may fall in just a few hours. Given how wet we are, that could easily cause flash flooding issues to develop. That’s some very cold air coming in behind that front with highs that may stay in the 30s next weekend. Folks, this is a full blown winter pattern setting up over the next few weeks. Not only should it bring the first flakes our way, it can very well put down the first accumulating snows. Thanks Chris for the heads up about tomorrow’s severe threat. I hope it doesn’t get that bad but if it does I know you will be there to keep us informed. As far as winter weather is concerned, timing could be good for a Christmas snow? :). ( I’m always the eternal optimist). Have a good afternoon everyone. I am planning on losing my electric again. Be prepared and take care. As Mike S mentioned this morning, Nov 5 2005 is a notable analog for tomorrow’s potential severe t-storms. Just yesterday, NWS Paducah in looking back stated that a relatively low tornado risk was forecast for that day thirteen years ago yet there was still the F3 (EF scale was still a few years away) that caused the m-a-s-s casualty event at Evansville IN. Besides striking extremely vulnerable mobile homes, another deadly aspect of the twister was that it hit at nearly 2am. Needless to say, being in sturdy shelters and having working early warning devices are so critical in saving lives. As it was, November 2005 was packed with potential severe wx events in addition to Nov 5. Some of them fizzled. But on Nov 15 occurred a fatal F3 near Princeton KY as well as the impressive F4 at nearby Madisonville. Kentucky and Tennessee have only had a small handful of November F4s in recorded history (no Nov EF4s in these two states to date, hopefully that does not change anytime soon). As if this was not enough, a late November 2005 outbreak across the Deep South led to loss of life in Arkansas. 2018 has shown some similarities to 2005 such as a near neutral El Niño – Southern Oscillation (ENSO) conditions. Both years had very inactive spring tornado seasons. November 2018 is showing signs of perhaps rivaling the very active fall 2005 severe wx season… and November 2018 has only just started. Not looking forward to it. I love general thunderstorms but not the bad stuff. I’d rather just watch severe weather on YouTube than actually experience it. I have already lost a huge tree this year and no power for a day. Could have been worse. I kept hoping the slight would go south, and yet the moderate is getting closer 🙁 After this year, I’m starting to long for boring weather. Yea, tornadic systems from the west/southwest towards southeast Kentucky seem to lose a lot of their tornadic energy. Long stretches of rugged terrain tend to interfere with tornado genesis. The so-called Superoutbreak of April 3 1974 may be a good example as while areas around Somerset, Corbin, and Knoxville were very hard hit, tornado activity largely ceased from those points on. But an anomaly from the 1974 Superoutbreak was an F4 tornado that still occurred near Beckley WV despite hundreds of miles of rough topography beforehand. Thus there can be rare exceptions to any rule. BTW, this particular tornado even traversed the New River Gorge! NWS Louisville has more details on the short-lived EF-1 in Hardin County KY that occurred last week. Looks like things are getting better organized according to modeling.. Western, Southern Ky and middle Tenn could be in for a rough time..